A new retail building is under construction next to an existing building being renovated in a high-traffic Triad location circled by roads. 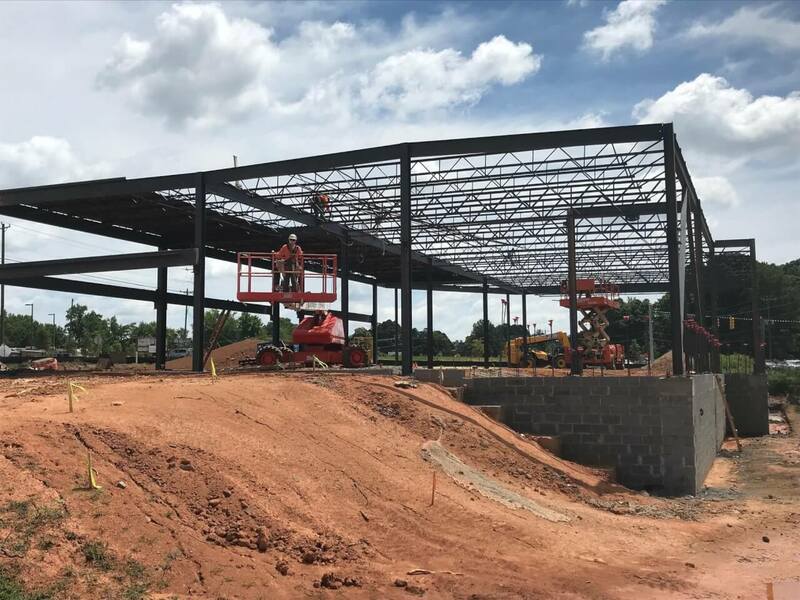 Greenwood & Charles of Winston-Salem is developing a new retail building in Kernersville on the round-about across from the new Lowes Food store on Market View Drive. Meanwhile, the developer is renovating in existing building with a South Main Street address that will become a Mattress Warehouse store. Ladd Freeman of Freeman Commercial Real Estate told Triad Business Journal that the developer is referring to the project as “Market View Center,” though an official name is not planned. The two buildings will be surrounded by parking in the circle, which is bordered by South Main, Old Winston Road and Market View Drive. The buildings will be accessed by two entrances on Market View and another on Old Winston. The project architect is Peterson-Gordon Architects of Winston-Salem. According to Fourth Elm Construction, the general contractor, construction began in May, and completion is scheduled in November. The new five-tenant building totaling 7,634 square feet will have an all brick exterior with storefront glass and canopies. According to the Freeman Commercial Real Estate website, Mattress Warehouse will be the lone tenant in a renovated 4,772 square foot building on South Main that formerly housed multiple tenants. Papa John’s Pizza will move from its current spot in the under-renovation Mattress Warehouse store into the new building. The remaining four storefronts in the new building will have 6,223 square feet of space, ranging from about 1,200 square feet to just over 2,000 square feet. Freeman Commercial is offering the space at $26 per square foot with a tenant improvement allowance negotiable. Freeman said Papa John’s is the only tenant committed to the new building, but he’s gotten several inquiries about the shops. Mattress Warehouse has three stores in Greensboro and one in High Point, but no locations in Forsyth County.